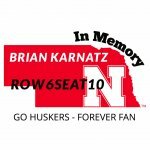 Matt, thanks for honoring Brian. I doubt he would have liked the attention but I can assure you that our family thinks it is pretty cool. By the way, I saved some of his old ticket stubs from Devaney. Of course two of them are from Row 6 Seat 10. L-R 1. GA ticket from 94-95 2. LSU game (Won 77-63) from 2009-10 which was Nebraska's most successful season, 32-2, BIG XII Champions. Pictured are seniors - back, Kelsey Griffin, Nikki Bober, Cory Montgomery; front, Kala Kuhlmann, Nicole Neals, Vonnie Turner. 3. Penn State game (Lost 67-82) - last WBB game played at Devaney featuring Lindsey Moore on the ticket. Row6Seat10 WAS there in spirit today. His good friends Richard and Denise Soukup (left) made a banner in his honor and long time Husker fan Kay (sp?) and I joined them for a photo after the game.